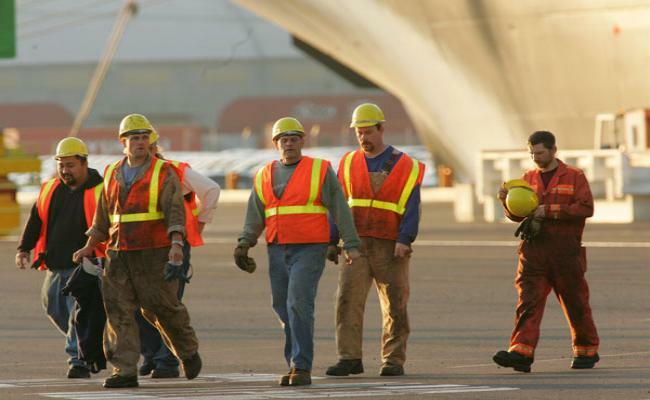 On February 20, the ILWU reached a tentative agreement for a new 5-year contract with the Pacific Maritime Association (PMA). And on April 3, ILWU Coast Longshore Caucus delegates voted by a margin of 78% to recommend approval of the tentative agreement. The proposed 5-year contract covers 20,000 dockworkers at 29 west coast ports. ILWU International President Bob McEllrath claimed victory, saying “we secured a tentative agreement to maintain good jobs for dockworkers, families and communities from San Diego to Bellingham.” Indeed it is likely that the ILWU may have won most of its demands, including maintaining health benefits for workers, families and pensioners, continued ILWU jurisdiction for inspecting chassis units at the ports, and improving the arbitration system to make it fairer. Those last two issues were the most contentious. Chassis are the wheeled, flat beds used by trucks to transport cargo after it leaves the ship. The PMA used to supply chassis, and ILWU had the right to inspect them. But in recent years the terminal operators sold their chassis to equipment-leasing companies who are not members of the PMA, and had no contractual relationship with the ILWU. These companies frequently hired non-union or non-ILWU labor to maintain and repair the chassis. The demand for jurisdiction also escalated the conflict between the ILWU and the Machinists who also maintain chassis at some terminals on the West Coast. 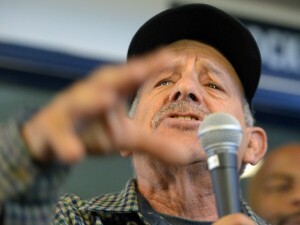 The overall issue had serious repercussions, as hundreds of ILWU members are mechanics, whose jobs would have been threatened if the ILWU had lost jurisdiction over chassis maintenance and repair. Arbitrators, who mediate on-site disputes between the unions and the PMA, were also an issue. The previous agreement was that both parties must agree to dismiss the arbitrators, which common sense dictates is hardly likely to happen. 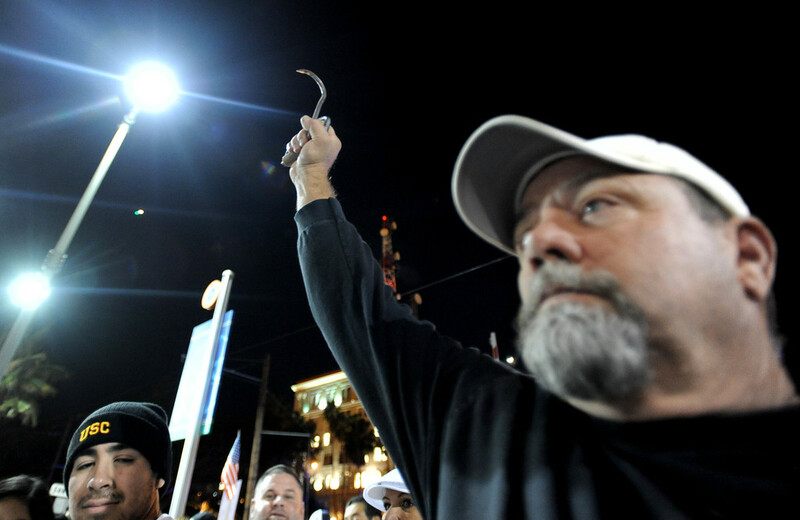 This was clearly the longest struggle between the PMA and the ILWU in over ten years. The PMA and ILWU, representing thousands of workers at 29 West Coast ports have been negotiating an expired labor contract since May 15. The six-year contract ended on July 1. The PMA, or Pacific Maritime Association is a global corporate entity, its 72 member companies compose of container shipping cartels, bulk cargo carriers, terminal operators and stevedores. Its largest members include Denmark-based Maersk Line, Korean-based Hanjin Shipping, Japan-based NYK Line, Hong Kong-based OOCL, China-based COSCO, and terminal operators like SSA and others. The shipping magnates went all out with a variety of tactics to break the union’s ability to negotiate its conditions and work flow. By mid-January, the PMA had eliminated night and evening shifts, slashing container and cargo loading and unloading operations by 60%. The PMA created slowdowns on the docks, while blaming ILWU workers for them. Terminal operators claimed they couldn’t accept empty cargo containers to load because of overcrowded docks. Last month, they had cut crane crews and eliminated night shifts, claiming too much congestion on the dockside yards. This was shown to be a lie, as the ILWU took aerial photos showing plenty of room on the docks. The ILWU maintains that there are major changes in the industry that make their job more difficult. And they are right. Larger ships: As a way of insuring profits since the recession upended the shipping industry, containers are being shipped on larger ships. Unloading these becomes much more logistically challenging, there are ships coming in that are carrying 14,000 TEUs [20-foot containers]. Some recent orders for new ships have been even larger, with capacities of at least 18,000 TEUs. Visualize a ship as long as the Empire State Building is tall and 10 freeway lanes wide. In the past, the average vessel carried 6 – 8,500 TEUs. The impact of these large ships is exacerbated by shipping alliances that pack a larger variety of goods on the same ship. The organization of these products takes more time than in the past when most goods coming off a ship came from the same place. Peak time congestion: Once off the ship, cargo still has to go to distributions centers, some of them a significant distance from the docks. At the Los Angeles/Long Beach port complex, importers and exporters pay a premium to pick up and drop off cargo containers during the day. Still, carriers concentrate inbound and outbound traffic during certain times of the day, adding to freeway congestion. Clogged roads affect the Port of Seattle as well, as it located near an urban area with a narrow transportation grid, where it takes longer to get goods in and out of the port over highways that are already carrying the maximum amount of single passenger vehicle traffic. Coal/Oil trains: Coal and oil shipments by rail have become top priority of the BNSF railroad. Ports and retailers suffer as those items receive priority, pushing everything else down the line and slowing transfer of containers and bulk agricultural goods. Automation: As terminals become overwhelmed by concentrated growth in volumes, stevedoring companies are trying to implement more mechanization and computerization to load and unload bigger vessels, shuttle boxes to and from the storage yard, stack containers, lift them on and off truck chassis, and process trucks through the gates. Two terminals in Southern California – OOCL’s Middle Harbor facility at the Port of Long Beach and the TraPac Terminal at the Port of Los Angeles – are being upgraded to include automated rail gantry cranes and other technology that will make them among the most modern port facilities in North America. These terminals deploy the latest technologies, such as remote-controlled, rail-mounted gantry cranes to stack and store containers, and remotely guided carts to ferry containers into the yard. This prompted a dispute with ILWU Local 13, who staged a series of job actions until a settlement was reached to include ILWU members in the control room functions and guarantee data sharing with the union. During the last contract that expired at the end of June, the International Longshore and Warehouse Union agreed to allow technology at marine facilities as long as the parameters of each deployment were negotiated on a case by case basis. But not all ILWU members win this fight. Several years ago, almost 100 jobs were eliminated when APM Terminals introduced similar technology in Norfolk, Virginia. This reflects a need by the Longshoremen not to allow the terms of automation dictated to them. The fact is that the global shipping industry has never recovered from the Great Recession. That crisis produced a drop in global trade which caused a loss of profits from one end of the shipping industry to the other. As one example, the global market for bulk freighter charters is below levels of the worst days of the global financial crisis in late 2008 and early 2009. Large freighters that cost $8,000 to $9,000 a day to operate, plus $20,000 or more a day in interest payments and other ownership costs, are now leasing for about $4,000. Given this crisis, the drive to cut costs, deploy more automation, and hire non-union or other unions as labor is not going to stop. 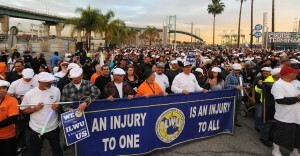 The ILWU needs to employ new strategies and tactics or it will lose control over its labor altogether. Looking at the recent West Coast strike against EGT at the Longview Grain Terminal supplies some lessons. EGT locked out grain handlers for a year and a half as the company tried to operate its new state-of-the-art terminal with the more compliant IUOE, instead of the ILWU. It wasn’t until the backup of grain shipments threatened the fall harvest that a settlement was finally reached. The union local waged a sharp struggle with strong community support, including months of picketing and even briefly occupying the grain terminal, as well as a sit down on the train tracks to block trains from moving grain out of the terminal. But despite the militancy, ILWU top leaders hesitated to rely more deeply on community support or call on support from the rest of the labor movement. 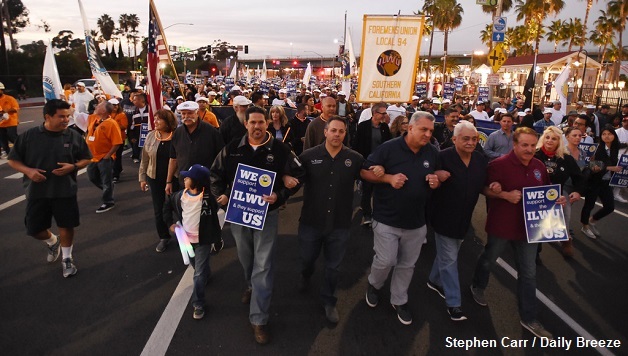 In fact, the grain lockout seemed to push the ILWU leadership towards a more inward facing strategy with its members and a go-it-alone approach with its allies in and out of the labor movement. Yet without that crucial support, EGT could deploy its overwhelming economic power while the union had to face injunctions that are a hallmark of the unfavorable legal terrain that favors employers. The result was that EGT forced open the master contract, winning the right to hire non-union workers for console operations—the workers who separate, weigh, and control the flow of the grain from the vessel to the terminal. They can also now deploy smaller crews to handle a two-spout loading operation. Most important, there are now serious concerns that a precedent has been set with this contract, and may open the door to similar concessions at other terminals. The recently concluded container contract negotiations may well have reinforced those trends, with a top down negotiating approach that left the rank and file in the dark. Although ILWU International President Bob McEllrath acknowledged the role of the rank-and-file members and local union officials “for maintaining exceptional discipline and unity during the grueling 9-month negotiating process,” the overall message was just trust the negotiating team to settle the issues, ignoring the union’s legacy of flexing their members muscle on to the docks to reinforce their strength at the negotiating table. This history is a crucial strategy to remember, especially given membership turnover as older members retire. In the EGT struggle, for example, half the dock workers entered the industry after the 10-day lockout of 2002. In some cases, local leaders in various ports are starting to push for more public displays of solidarity and support. But much more is needed to reach out and support other workers in cargo operations, union or otherwise. For instance port truckers in the port of Los Angeles-Long Beach and other West Coast ports who’ve been struggling to unionize, including some wishing to affiliate with the Teamsters. Solidarity between unions, as well as helping to organize the unorganized, is a necessary strategy for the union’s long-term survival. 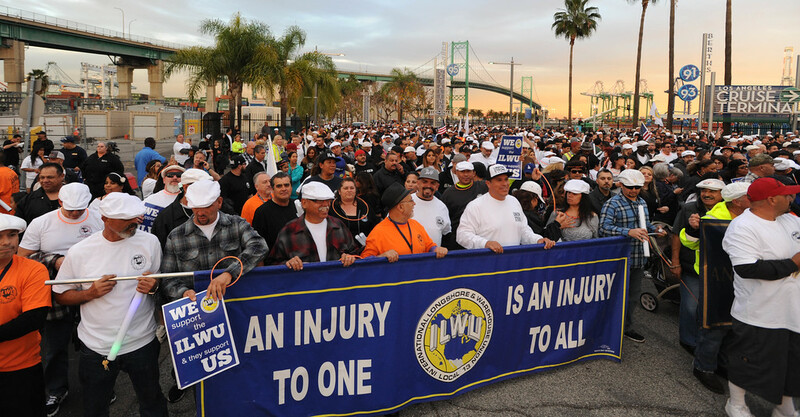 Without that ILWU members will see their power and numbers erode, as shippers and terminal operators continue to automate and pit different sections of port workers against others. Community and cross-union solidarity is the only way forward for all sections of the working class.